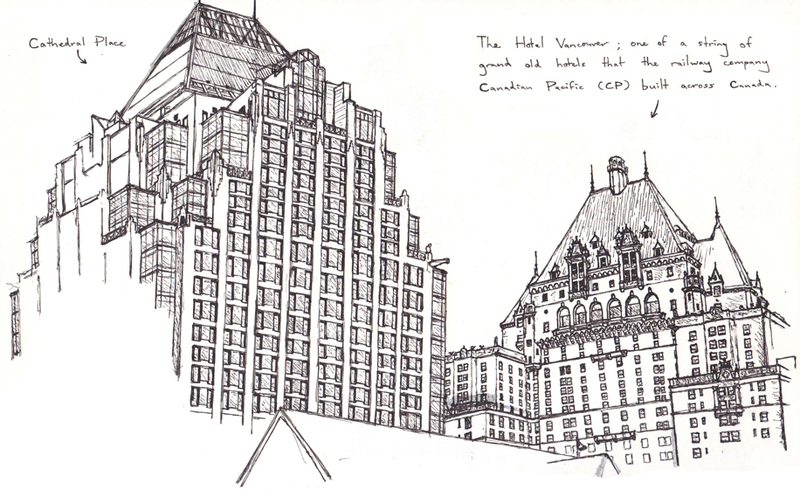 Drawn on the right is the third incarnation of the Hotel Vancouver, built from 1929-39. 17 storeys high, the monumental hotel was inspired by French Renaissance châteaux with touches of the Scottish baronial. This quintessentially Canadian style was popular during the late 19th and early 20th centuries, exemplified in the grand railway hotels built by rival companies Canadian Pacific (CP) and Canadian National (CN). Canadian Pacific landmarks include Toronto’s Royal York, Quebec’s Château Frontenac, Victoria’s Empress Hotel and a few rural resorts within national parks, most notably the Banff Springs Hotel. 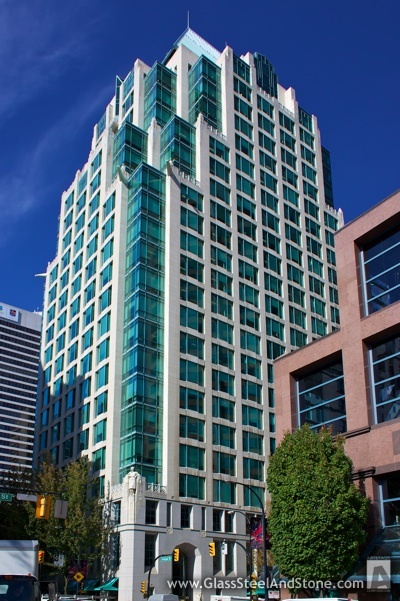 I must also point out that my original annotation was incorrect – alongside Ottawa’s Château Laurier and six other properties, the Hotel Vancouver was built by CN but later purchased in 1988 by its main competitor. They are such beautiful works of architecture, aren’t they? I stayed at the Chateau Montebello many years back but my recollections of it are rather sketchy. However, I remember being amazed by the Banff Springs and Chateau Lake Louise – not just with their natural setting but also the lovely interiors. Happy Canada Day to you too! Another awesome sketch of yours James! 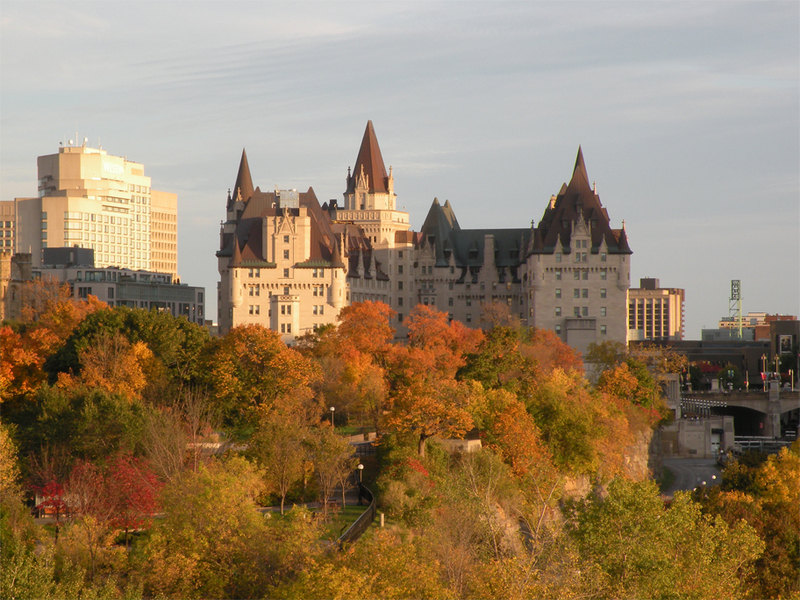 Speaking of Canadian architecture, I remember how amazed I was when I first saw the pictures of Château Frontenac. That and a few other pictures drew my attention to Canada when I was in high school and reading your old posts on the country only made me want to go there even more. Thank you, Bama! I would love to return to Montréal and Québec City someday – you would certainly love the historical feel of both those cities. I’ve long dreamed of traversing the entire country by rail from West to East… perhaps we should make that one of our future joint trips! Hi James, did you really make that sketch? That’s pretty impressive. What an awesome thing to do than just taking photos. I love so many things in Vancouver, including architectures. Thanks for the history bits of these buildings. I did Marisol, back in the day when I was still a budding architecture student. Vancouver is such a gorgeous place – it’s not hard to see why it consistently ranks among one of the world’s best cities to live in! You can sketch! Impressive. Your talents know no boundary! Wow, that would be a really cool trip. I need to see more of Canada! People keep telling me that I’d like Montreal. I need to go see it myself.